A transfer configuration defines the rules based on which files or folders are transferred between two locations or inside a location. Please consult the type configuration option to see the list of supported transfer types. A new location can be added or changed via Local Manager below. See below for an example of an initial configuration for a move transfer. 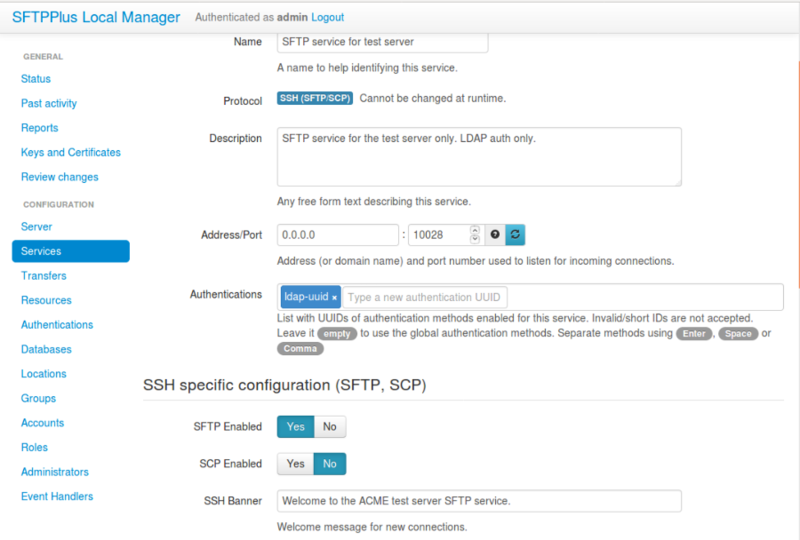 Adding a new transfer configuration is done by creating a new section inside the configuration file. The name of the section should be prefixed with transfers/ and followed by the transfer’s UUID. The transfer’s UUID can be any unique string used to identify the transfer. Once defined, the UUID should not be changed. For more information about UUIDs, please see the dedicated UUID documentation. description = Nightly orders exported by the accounting application. Determines whether the transfer should be automatically started at server startup. Human-readable short text used to identify this transfer. Human-readable text that describes the purpose of this transfer. This option specifies the type of the transfer. When the copy type is configured, the transfers will copy files from source to destination and process them using the configured actions: executing external commands before and after transferring the files, archiving the files, etc. The move type is similar to copy . However, once the transfer is successful, source files are removed from the source location. Source files will still be archived, if configured so. If transfers fail, the files are not removed from the source location regardless of the cause. Absolute path on the local file system. Path to the monitored source folder. Determines whether the monitor should look for source files and folders only in the configured path, or recurse in all its descendant folders. This is the time interval that defines the delay used to observe the changes in the monitored path and compare snapshots, a record of any changes, in a monitored folder. This is the interval after which a file is considered stable if no changes are made to it. Globbing expression containing wildcard characters . Only files matching the expression will be transferred. Only file names are filtered, all folder names will be transferred. Leave it empty or set it to Disabled to transfer all files. UUID of a defined location. Empty - local file system location. UUID of the location used as destination for this transfer or empty to use the local file system location. Absolute path on local file system. Relative path to server installation folder. Path to the destination folder of this transfer. This option allows uploading a file using a temporary name, renaming to its initial name once all the file’s content was transferred. Leave it empty to always transfer a file to its destination using the original name. This configuration option is ignored when destination_path_actions is set using the temporary-suffix action. 0 to disable batch transfer. Number of seconds to wait for new files to be part of a batch. You can configure the transfer to send each file as an independent transfer, or group multiple files into a single transfer; what is called a batch mode. If the transfer of one or more files from the batch fails in batch mode, the whole transfer is considered to have failed. The transfer is considered to have been successful only when all files from a batch have been successfully transferred. A batch transfer is started if no new changes are recorded in the configured time interval. Each new change will reset the time interval. If a transfer is stopped or fails while a batch transfer is waiting for the batch interval, the whole batch will be canceled, and no files will be transferred. If a transfer is suspended while a batch transfer is waiting for the batch interval, the files accumulated until then will be transferred. To disable batch mode and transfer each file as an individual transfer, set this to 0 . When batch mode is disabled, execute_before , execute_after_success and execute_after_failure commands are executed for each individual file. When batch mode is enabled, execute_before is called before transferring the first file from the batch, while the execute_after_success and execute_after_failure commands are called after the last file from the batch was transferred. You can configure the transfer to wait for a file with a specific file path or file path pattern before transferring the files. The marker file needs to be located inside the source path. The matching expression should be defined in such a way to match the whole path of the targeted file, and not just the file name. A single file should be matched by the expression. When the expression is matching multiple files, the transfer will fail. Please get in touch with us if you want to have a transfer waiting for multiple files. For transfer with recursive source, you can configure the marker at any place inside the source sub-directories. The batch transfer will include any files located in the same directory as the batch marker as well as any files in the sub-directories. The transfer will start 15 seconds after the marker file was detected. Leave it empty to not delay the transfer based on a marker/flag file path. For more details about defining a transfer with a file marker, see the transfer operation guide. Path to local script or executable to call before a file is transferred. The executable is called with the full path to the file that is about to be transferred. This should be configured only with the path, and without any other command line arguments. You can use a wrapping script/batch file to have the executable called with a set of default arguments, or to call multiple executables. SOURCE_PATH - is set to the source path of the processed file. For batch transfers, only the first file from the batch is sent as an argument. The transfer continues only if the command’s exit code is 0 . This means that when the exit code is not 0 , the file is not transferred (copied, moved, etc. ), and no other actions are done for this transfer. When the source location is remote and the destination is a local location the command will be called with a path that does not exist yet, as this is executed before the actual transfer takes place. On Windows, executables located in Unicode paths and monitored Unicode paths are not yet supported. Remote to remote transfers are not supported. Path to local script or executable to call after a file is successfully transferred. Please see the description of the execute_before configuration option. For batch transfers, the command is called with the path of the last file from the batch. The command is not called when execute_before fails. Path to local script or executable to call after a file fails to be transferred. This is called once, after all retries have been executed. The command is not called if execute_before fails. List of commands to be executed in the destination location. Before starting the transfer of a file or a batch, execute in the destination location the list of configured commands. Each command should be defined on a separate line or delimited with a semicolon (;). The commands are executed using an embedded client-shell. The shell is already connected to the destination location. There is no need for an explicit open command. For the list of supported commands, please check the client-shell documentation. Transfer continues only if commands are successful. When one of the commands fails, the file is not transferred (copied / moved / etc. ), and no other actions are completed for this transfer. See description of the execute_on_destination_before configuration option. The commands are executed if the file or the batch have been successfully transferred. List of commands to call after a file fails to be transferred. The commands are executed if the file or the batch transfer have failed. Path to a folder in the local file system used to keep a copy of successfully transferred files. To disable archiving, leave this option empty, or set it to Disabled . To prevent overwriting previous files, new files are copied to the archive folder with timestamps inserted in their names. Timestamps are inserted before file extensions. When a file has no extension, the timestamp is appended to the file name as an extension. A file named README.rst will be archived as README.2014-12-03-13-00-57-967636-036.rst, while a file named README is README.2014-12-03-13-00-57-967636-036. Archiving is disabled when a transfer source or destination location is not a local folder. Path in the local file system. Path to local folder in the local file system used to keep a copy of unsuccessful started file transfers. When execute_before or execute_on_destination_before commands fail, the file transfer is not considered started, and the archiving stage is not executed. To prevent overwriting previous files, new files are copied to the archive folder with timestamps inserted in their names. See archive_success_path for more details about the timestamp’s format. When the remote file is partially transferred, the partial file is archived. When the source is a remote location and the file has not yet been copied to the local file system, an empty file is copied in the archive. Archiving is disabled when a transfer has both source and destination as remote locations. This is the number of times a failed file transfer is retried. When set to 0 , failed file transfers are never retried. For batch mode transfers, each failed transfer of a file inside the batch is retried. Number of seconds to wait before retrying a failed transfer. When set to 0 , there will be no waiting time. As soon as a file transfer fails, it will be retried. Empty to have the transfer always active. Comma-separated list of 24HOUR:MINUTE-ACTION_NAME actions. Comma-separated list of WEEKDAY-24HOUR:MINUTE-ACTION_NAME actions. Multiple lines of comma-separated values of actions. Comma-separated list with scheduled actions for this transfer. Times are defined using a 24-hour based on the local time zone. For longer schedule definition you can define the actions across multiple lines. Time resolution is one minute. Please contact us if you need a higher resolution. For more details about defining a transfer with scheduler, see the transfer operation guide. fail - abort transfer if destination file already exists. overwrite - always overwrite existing files with the content of the new source files. Emits an event when a destination file is overwritten. timestamp-always - always transfer the source file with an amended timestamp and prevent accidental overwriting on the destination. timestamp-to-new-file - transfer the source file with a timestamp only if a file with the same original name exists at the destination. timestamp-to-existing-file - transfer the source file with the original name and, when a file with the same original name exists at the destination, rename the existing file at the destination. Rule used to decide how a transfer handles the overwriting of an existing file at the destination. When the file is transferred with temporary-suffix , it will check for the existence of the final file name on destination, not the file name with the temporary suffix. The transfer does nothing to prevent external applications from tampering with the existing file during a transfer. It assumes that no other application is managing the local or remote files during a transfer. List of rules, separated by newlines. Rules defining the action taken to the destination path and file name, as transferred to the destination location. This is a comma separated configuration value. The first value is the full source path matching expression for the source file with a path relative to the configured source_path . Globbing expression or regular expression can be used. For more details, see the matching expression documentation. The second value is the name of the action performed on the source file name and source path in order to define the destination file name and destination path. You can specify multiple rules, one per line. Leading and trailing spaces are ignored. Empty lines are ignored. When a path is matching multiple rules, it will have the effect of multiple actions applied for the same path. The actions are applied one by one, from top to bottom as defined in the configuration. The result from the first action is used as the input for the second action. Leave it empty to not define any actions and have the same file path and file name as from the source. When action rules are defined, and the current transferred file does not match any rule, the transfer will fail. You can use a file *, no-action rule to explicitly instruct SFTPlus that you don’t want an action for the file names not matching any of the previous rules. path. This result in flatten destination. This action has no parameters. used to replace the source path separator. case. This action has no parameters. the file, renaming it back after all the content was transferred. source. This action has no parameters. For more details and examples on the available actions, see the client-side file transfer usage guide.